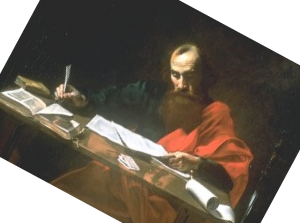 The apostle Paul, writing a letter. 1:10—For am I now seeking the favor of men, or of God? Or am I striving to please men?—In Paul’s own defence he sets forth the idea that if he was a man-pleaser, he certainly would not have pronounced a curse on those who preach false gospels! Rather, in seeking the favour of God, for the sake of the gospel, he would pronounce such a curse on those who falsify the gospel. Paul is standing with Christ and not with man. If I were still trying to please men, I would not be a bond-servant of Christ—Paul makes a statement that many of us should take to heart. If we adapt our gospel to please man, to accommodate sinners, to take the edge of the gospel so that it does not offend the wayward, then we have failed miserably as servants of Christ. In fact, when we have softened the gospel for the sake of man, then we are not servants of Christ. The gospel by nature offends people (Rom 9:33), since it shows them their utter helplessness in their own despicable sinful nature. It tells them that God’s wrath burns against them (Jn 3:36; Rom 1:18; 2:5; 9:22; Col 3:6) because of their sin and this flies against the thoughts of man of his own goodness. The word “bond-servant” comes from doulos (δουλος), “slave…esp. of the relationship of men to God [whereby man is] owned by him body and soul.”1 We are not mere servants of Christ but slaves to Him. A slave always seeks to please his Master and not anyone else. Paul is making the point that since he was called directly by Christ to be His apostle and also since he is preaching the real gospel, there is no need for him to seek the approval of men, but rather that of God. 1:11—For I would have you know, brethren, that the gospel which was preached by me is not according to man—Since Paul is not trying to please men he continues to show the Galatians that the gospel he is preaching is not from a human source. Just two verses ago Paul spoke a curse on anyone who taught a different gospel and now he is about to demonstrate that the gospel he is preaching is not from man. By implication he is showing that the gospel of the Judaizers is from man. 1:12—For I neither received it from man—To further demonstrate that the gospel he preached was not from a human source, Paul emphasised that he did not receive his gospel from man. In verse 11 Paul simply stated that his gospel did not have a human source. Now he continues with this development to show that he did not receive this gospel from another human person. The word for “received” is paralambano (παραλαμβανω) which means to “take over, receive.”2 In this sense Paul is saying that he did not take this gospel from another man and is not preaching another man’s gospel. nor was I taught it—The Galatians were taught by Paul. In this way, they received the gospel from him. In the same way, many other believers were taught what the gospel was. To show that his gospel was not from a human source Paul reveals that he was not taught the gospel by any human agent. The other apostles were not taught by humans and in the same way he was not taught by humans either. 1:14—I was advancing in Judaism beyond many of my contemporaries among my countrymen, being more extremely zealous for my ancestral traditions—Paul had a fiery zeal for what he believed in. This existed before his conversion as much as it did after. For Paul it was either all or nothing! “advancing” comes from the Greek word prokopto (προκοπτω) which means to “go forward, make progress.”4 For someone to advance in anything, it is always imperative to ensure that the superiors are pleased. Undoubtedly this was the case. Paul’s advance was of such a nature that his Pharisaic leaders were all too ready to give him letters to bind and bring Christians before them. 1:15—But when God, who had set me apart even from my mother's womb—It would not be surprising if Paul had the two most important prophets in mind when he wrote verse 15. The parallels are striking. In Is 49:1, 5 Isaiah wrote of himself: “The LORD called Me from the womb; From the body of My mother He named Me… now says the LORD, who formed Me from the womb to be His Servant, To bring Jacob back to Him, so that Israel might be gathered to Him” Jeremiah wrote something very similar in Jer 1:5: “I formed you in the womb I knew you, And before you were born I consecrated you; I have appointed you a prophet to the nations.” Paul used the underlying Greek word for the phrase “set me apart” only twice concerning himself in his own writings. Apart from this occurrence he also used it in Rom 1:1. He used the word aphoridzo (αφοριζω), meaning to “set apart, appoint”5 in the Romans passage with an added purpose for being set apart. Paul writes that he is "called as an apostle, set apart for the gospel of God." Paul’s purpose for being set apart is similar to that of Isaiah and Jeremiah. Isaiah was called to bring Israel back to God and Jeremiah as a prophet to the nations. This was indeed Paul’s pattern of preaching the gospel. When visiting a city Paul would first preach the gospel to the Jews and then to the Gentiles; a reminder of his often repeated phrase “to the Jew first and then to the Gentile.” (Rom 1:16; 2:9, 10) Being set apart from his mother’s womb by God once again speaks of God’s predestinating work. It points to God’s sovereignty in the destiny of mankind. This is how Paul starts his account of his own conversion. He starts with the sovereign work of God. and called me through His grace—Paul’s conversion was certainly a sovereign act of God. When we read the account of his conversion in Ac 9 we soon realise that God sovereignly stepped in to save Paul. The meaning of “called” in this context as in other contexts of salvation “in the usage of the NT, as well as that of the LXX, [is] of the choice of pers. for salvation.”6 God is the one who calls us. God “saved us and called us with a holy calling, not according to our own works but according to his own purpose and the grace that was given to us in Christ Jesus before time began.” (2 Tim 1:9 ISV) We are not saved according to our own works, whether they are works of law or works of choice, but rather by the grace of God. When we look at the ordo salutis (order of salvation) so well defined for us in Rom 8:29-30, we find that our call to salvation is not the first event in our salvation. Paul writes in verse 30 that “those whom he predestined, he also called; and those whom he called, he also justified; and those whom he justified he also glorified.” (ISV) God first predestined us to salvation before He called us to salvation. We must always remember that God’s predestinating work is never based on any arbitrary choice pulled out of a hat, but rather on “the kind intention of His will.” (Eph 1:5) It is “according to His purpose who works all things after the counsel of His will” (Eph 1:11) that He predestined us to salvation. Because of this predestinating work of God, He called us to salvation. It is because of the wonderful grace of God that He calls us to salvation. As it has been said before, God did not have to save anyone at all, but because of His great grace he chose to save us. Since God is our Creator, He was free “to make from the same lump [of clay] one vessel for honorable use and another for common use.” (Rom 9:21) Why did He save some and not others? All His reasons for this are not made clear in the Scriptures, but we do know that God saved some “to make known the riches of His glory upon vessels of mercy, which He prepared beforehand for glory.” (Rom 9:22) God wanted those that are saved to understand His mercy; that they are not saved because of their greatness as special pieces of clay, but rather that He has shown them mercy. It is this special revelation that qualified Paul especially to preach Jesus to the Gentiles. Paul, as a Pharisee, would never have thought of preaching the good news to Gentiles. It was because of Paul’s background as a Pharisee that God revealed Christ in Paul in this special way so that he would then become the special apostle to the Gentiles (Rom 11:13; Gal 2:8; 1 Tim 2:7). I did not immediately consult with flesh and blood—It is important for Paul to show the Galatians that the gospel he is preaching is not as a result of consultation with other Christians. The reason for this is that if this were the case, then he could not claim to be an apostle of Jesus Christ. He would then be an “ordinary” Christian just like the rest of them. However, since he can demonstrate that the gospel he is preaching came directly from the revelation of Christ in him, he can also lay claim to the fact that he is an apostle of Christ. 1:17—nor did I go up to Jerusalem to those who were apostles before me; but I went away to Arabia, and returned once more to Damascus—Paul makes it clear that after his conversion, he did not go to Jerusalem (at that time headquarters of Christianity with all the apostles situated there) to learn about Jesus Christ. Instead, Paul went into Arabia and then returned to Damascus. The fact that Paul writes about “those who were apostles before” him shows that he regarded himself as an apostle in the same character as they. The popular reason for Paul going into Arabia is that Paul went there to learn about Christ in a deeper way. However, this is not so. “ And immediately there fell from his eyes something like scales, and he regained his sight, and he got up and was baptized; and he took food and was strengthened. Now for several days he was with the disciples who were at Damascus,  and immediately he began to proclaim Jesus in the synagogues, saying, He is the Son of God.” (Ac 9:18-20) If Paul started preaching Christ immediately then why would he have gone into Arabia to learn about Christ? 1:18—Then three years later I went up to Jerusalem to become acquainted with Cephas, and stayed with him fifteen days—The “three years later” is seen by many to refer to three years after his conversion. Since Paul is making an argument for his own apostleship of Christ to the Galatians, the point he is certainly making here is that he had no need to consult with the apostles in Jerusalem since he was already an apostle. After these three years he went to Jerusalem to get acquainted with Peter. However, he only stayed for fifteen days. The reason he stayed for such a short period was that “And he spoke and disputed against the Hellenists. But they were seeking to kill him.” (Ac 9:29 ESV) The Hellenists were Greek speaking Jews. When the brothers learnt of this plot to kill Paul they extracted him from Jerusalem and sent him of to Caesarea. James was the Lord’s brother in the sense that he was the natural son of Joseph and Mary. 1:20—I assure you before God that what I am writing you is no lie—The Judaizers insisted that Paul depended on the Twelve for his gospel, and as a result would not be an apostle. However, when Paul writes “what I am writing” he refers to his historical account of the events immediately following his conversion which he recounted in vv17-19. Paul ensures them that he is not telling a lie. We can verify Paul’s account by reading Acts 9. 1:22—I was still unknown by sight to the churches of Judea which were in Christ—At this point Paul was still unknown to the churches in Judea. That he adds “by sight” would point to the fact that they perhaps have heard of Paul by this time but had not seen him yet. He writes about the Judean church separately from Jerusalem since he had to leave Jerusalem so abruptly that he never had any chance to meet those in the Judean church. 1:23—but only, they kept hearing, He who once persecuted us is now preaching the faith which he once tried to destroy—The news of Paul’s conversion spread rapidly and even though the Judean church had never seen Paul face to face, they heard about him constantly. What they heard was most amazing! The same person that persecuted them previously and tried to destroy Christianity was now preaching what he tried to destroy. 1:24—And they were glorifying God because of me—Paul’s conversion was a source of great joy for the Judean church. Note that they did not glorify God that Paul no longer persecuted them, which would probably have been our response to a situation like that. Literally this verse says, “And they glorified God in me.” This is also the translation offered by the ASV, KJV and WEB. The reason they glorified God, was for God in Paul. Paul was now converted. The Judeans glorified God for Paul’s salvation, not that he stopped persecuting them. Arndt, William, F. and Gingrich, F. Wilbur, A GREEK-ENGLISH LEXICON of the NEW TESTAMENT and Other Early Christian Literature, Second Edition, The University of Chicago Press, Chicago and London, 1979, p205-206. Barker, Kenneth L. & Kohlenberger III, John R., Consulting Editors, Zondervan NIV Bible Commentary, Volume 2: New Testament, Premier Reference Series, An Abridgment of The Expositor’s Bible Commentary, Zondervan Publishing House, Grand Rapids, MI, 1994, p711. Wuest, Kenneth S., Wuest’s Word Studies from the Greek New Testament for the English Reader, Volume One, Galatians in the Greek New Testament, Eerdmans Publishing Company, Grand Rapids, MI, 1973, p50. Bruce, F. F., Paul Apostle of the Heart Set Free, Eerdmans Publishing Company, Grand Rapids, MI, 1977, Reprinted 1999, p75. Grudem, Wayne, SYSTEMATIC THEOLOGY: An Introduction to Biblical Doctrine, Zondervan Publishing House, Grand Rapids, MI, 1994, p908. Friberg, Timothy & Friberg, Barbara & Miller, Neva F., Analytical Lexicon of the Greek New Testament, Baker Books, Grand Rapids, MI, 2000, p232.